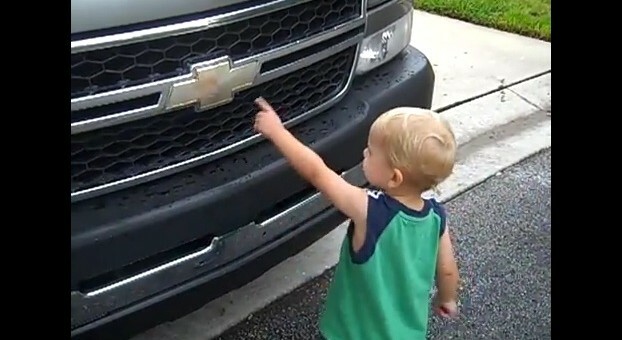 Video: What Does Little Thomas Think Of The Chevy Silverado? What does it mean when a toddler points to the bow tie on a Chevy Silverado and tells you that it’s “a good idea”? Perhaps the answer to that question is truth and intuition… and that little Thomas is a wunderkind. Now, who here hopes that — upon being shown Ford’s Blue Oval — little Thomas would start crying and say that the Ford truck a bad idea? Hey, I loved my F150! In my expeiance I found the F150 to be more reliable(and more fuel efficient) than the Silverado after 150k miles, but they are both superb vehicles. Oh and the F150 looks much better the Silverado, though I doubt most people who buy these trucks care about looks. Nothing can touch the new Duramax nowadays, sure interior is better on the superduty, but when it comes to frame, powertrain, performance, and reliability, superduty is a step or two behind. Only Duramax/Allison and Cummins=reliablity. Is the new Ford diesel/Powerstroke less reliable? I always had and have diesel trucks, my friends and relatives drive diesel trucks, I heard some guys complain recently with some minor problems, but on youtube this guy had his valves overheat that they just snapped off. The other guy went to a dealership to service his truck, and noticed they were rebuilding/replacing 6.7 due to lock up. Ford don’t have luck with their diesels for almost a decade now. He’s either really smart or just as sick of Mike Rowe as the rest of us.